With Iron Man 3 opening this weekend, we enter the Summer Movie zone. Ah, the smell of popcorn and industrial-strength air conditioning… Big budgets, big stars, big plot-holes… Summer movies have crept forward from the traditional Memorial Day weekend starting point, because why, again? Because if they open something big the first week of May, it will sell. Over at Beery Method, Nick has been busy with the design, illustration, and general creative goodness. Everyone who knows Nick will agree that this time of year holds special appeal for much of his work, and right on cue he’s hosting an Urban Undead event with D-Structure San Francisco, this Friday, Oct. 2. If you are Nor-Cal inclined, check it out on Facebook or via his blog. The event will also launch Defiant Apparel, which will no doubt provide more quality weirdness. Also looking forward to some views of the Pulp Street characters – parade-style muppet heads with gruesome wit and charm – perfect for October. And next week brings the Legion of Doom Feat show, featuring Nick, Xavier Lopez, and Jesse Link. One suspects this will be a busy month tor Beery Method. …by Max Brooks. In World War Z: An Oral History of the Zombie War, the author tells the story of a massive zombie outbreak through interviews with key participants and survivors from all across the globe. These interviews, of soldiers, politicians, bureaucrats, and everymen, chronicle the Zombie War from outbreak to eventual triumph. It’s one part fictional historical fiction, one part novel-in-short stories, with plenty of horror and sociological commentary thrown in. It’s an awesome idea – the kind I wish I would have come up with – and Brooks (son of Mel) not only turned the book into a bestseller, but used it’s predecessor, The Zombie Survival Guide (Beemsville review here) as a sort of research thesis to lay the groundwork for this story. The audiobook version features a host of familiar voice-talent, and I’m told is quite good. To the surprise of nobody, a movie is currently in development. But back to the book itself… The narrative takes place approximately ten years after the end of the war. It’s an oral history commissioned by the UN to collect first-hand accounts. Brooks splits it into three basic sections: the initial outbreak, the great panic with humanity in full retreat, and the war to retake the planet. The narrator/interviewer moves around the globe, chronicling the effects and responses of various societies’ showdown with the living dead from China to Pakistan to the UK. The international approach is one real strength of the books – probably a third of the interviews deal with the USA, with the remaining two-thirds focused on the rest of the planet. …by Max Brooks. The Zombie Survival Guide came out in in 2003, a key component in what some have dubbed the Zombie Renaissance in horror writing and other media. 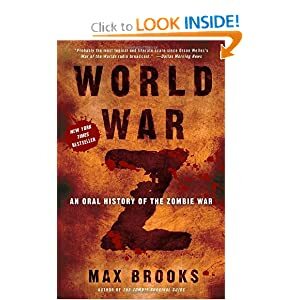 With this book and his novel, World War Z (which is on my reading list), Brooks both took advantage of and helped spur on the profusion of undead fiction. The ZSG is exactly what the title says it is : complete protection from the living dead. It’s written as a handbook or manual in the tradition of outdoor, disaster, and yes, nuclear survival guides of years past, and Brooks’ commitment to the material is complete. There are no ironic twist or humorous winks in this book (despite the fact it may be found in your book store’s humor section). The guide begins with a description of the virus Solanum, which causes humans to become zombies. These zombies have no respiration, metabolism, or higher brain functions. Their only instinct is to feed – preferably on human flesh. They aren’t the fast zombies of 28 Days Later or the mystic zombies of Caribbean and African mythology. They are single-minded feeding machines in vaguely human form. They survive until the flesh falls from their bones or their brains are severely damaged. Thus does Brooks define his monsters, which seem most like the zombies of older movies and most notably, Robert Kirkman’s Walking Dead. …directed by Ruben Fleischer, written by Rhett Reese and Paul Wernick, starring Jesse Eisenberg, Woody Harrelson, Emma Stone, and Abigail Breslin. 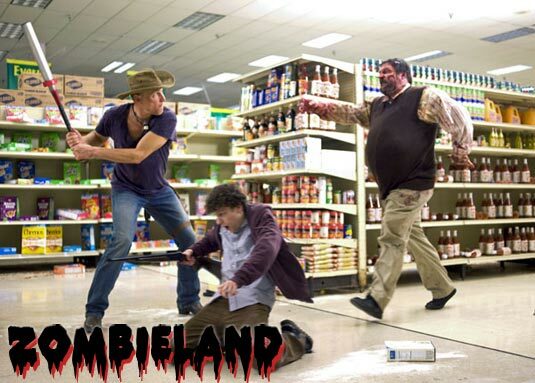 Zombieland is a light-hearted buddy comedy about the eventual Zombie apocalypse that will consume us all. It begins with the standard zombie premise with which we’ve grown accustomed – a horrible viral infection turns people into ravening beasts and all hell breaks loose. We learn from our narrator Columbus (Eisenberg) the rules to surviving in Zombieland, including 1) cardio, 2) the double-tab, and 3) seatbelts. Columbus, it turns out, is the kind of young guy with a lengthy list of phobias and a penchant for World of Warcraft. This actually serves him well, because he’s so cautious and paranoid he’s managed to avoid most of the mistakes that seem to have befallen the rest of the populace. When he meets up with Tallahassee (Harrelson), he find a complete opposite in nearly every trait. Tallahassee is fearless, somewhat careless, and an absolute zombie-crushing machine. It’s your standard end-of-days odd couple, and fortunately for the viewer, the two actors have a good sense of timing and chemistry.